Premium malted alcoholic beverage with natural flavor of grapes. Looking for a refreshing summer pop? 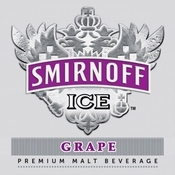 Smirnoff Ice Grape has a taste that's ripe for the pickin', so grab a bunch!